I want to begin with a big thank you for all the positive feedback about Remote Display Analyzer (RDA) and also a very big thanks to the members in the sponsor program, this really helps to drive RDA forward and to help balance the amount of time spend in this project by giving something back to the family. So thank you very much for becoming a sponsor! If you are new to Remote Display Analyzer (RDA), this tool will help you understand your remote display configuration and it’s behavior, it will only show you relevant information and help you decide which setting is the best for your specific use case. It’s also very handy for troubleshooting remote display configurations. RDA is just a portable executable without any installation needed, just run it in your remote session and you will get all relevant statistics and settings right away. There is a lot of new functionality in RDA 2.0, both under the hood as on the outside. I don’t want to make this a long article so I will just give you a short summary of the new features together with some print screens. Remote Display Analyzer 2.0 is now available for free on the website where you can also find more information about the sponsor program. Existing sponsors should have received an automatic e-mail about this new release. If you didn’t receive the mail please send an e-mail to support at rdanalyzer.com. Thanks again for your support! 18 November I did a presentation on E2Evc in Barcelona with Rasmus Raun-Nielsen (co-member of TeamRGE) about the differences between remote display protocols and codecs. The session was late in the afternoon so there was already some beers involved which made it a very fun presentation. We summarized the major remote display protocols available in the market. Rasmus then explained what NVENC is (a way to offload the display encoder process to the GPU) and which Nvidia cards supports this technology. I continued with an overview of the available codecs for each protocol and showed the latest Remote Display Analyzer (RDA) 2.0 version (which will be released soon!). Before the presentation I performed some comparisons with RDA 2.0 in combination with the video codecs found in Microsoft RDP, Citrix HDX and VMware Blast. This blogpost is a small recap of the presentation. Please note that this comparison is an independent view and that conclusions are based on my own observations. With RDP you basically have one option when it comes down to the video codec and that is the AVC codec in 4:4:4 mode. It’s enabled by default in the latest Windows versions and you can switch back to the previous codec combination with policies. You can’t really configure this AVC 4:4:4 codec, for example you can’t switch to 4:2:0 mode or change quality levels manually. I must say that the latest RDP versions improved a lot compared to the older RDP versions found in previous Windows versions. While the protocol is still quite bandwidth intense, it offers a very good remote experience. The AVC 4:4:4 mode really delivers a very sharp (near local) experience. RDP has it’s own hardware and software encoding technology and don’t support encoding capabilities like NVENC for their video codec implementation, hopefully they will leverage capabilities offered by mainstream GPU manufactures like Nvidia in the near future. RDP together with RDSH (and the upcoming modern infrastructure) is a very cost effective remote display solution, especially with the latest RDP improvements. Blast is a fairly new protocol compared to the others and it’s impressive to see how quick they are making progress with it. As you can see in the above table they do not yet offer a technique to achieve 4:4:4 quality for their video codec. They might be waiting for GPU’s to natively support 4:4:4 so they don’t have to build a software based optimization mechanism for this. They also have a bitmap encoder which you can switch on (Blast uses H.264 by default), but a combination of this codecs is not yet possible. Time will tell if they are focusing on a combination of codecs or optimizing their video codec for 4:4:4 quality. I think the latter makes more sense because currently their bitmap encoder isn’t that optimized compared to the others. Nevertheless I was impressed by the performance of their H.264 codec, as you can see in the comparison below. As you can see in the above table HDX has 2 combinations available to address the H.264 4:2:0 limitation. 1: The video codec with a text optimization technique (which is software based and done in CPU). 2: A combination of the bitmap and video codec, this is also known as the “Use Video codec for active regions” setting. For Citrix this makes sense because their bitmap encoder is really optimized throughout the years. In this combination of codecs the video codec is only used for parts of the screen that are changing rapidly, like playing a video for example. I wrote about the differences between the display modes available in HDX here. But there are some limitations, for example you can’t use NVENC in combination with this optimization techniques as of today. I hope to see expanded support for this in the near future. In version 7.16 Citrix has added support for the H.265 codec, this codec is so awesome in many ways as it can massively reduce bandwidth consumption by leveraging a new intra prediction mechanism. This first implementation of H.265 is 4:2:0 only for now (and only when you have a supported GPU), but hope to see more available options in the near future. All 3 protocols have ways to handle network congestion’s and changes in available bandwidth, they often refer to this with the term “adaptive transport”. They all standardized on UDP by now as the primary transport protocol for sending remote graphics down the wire. I separated the RDP comparison movie from the others to highlight even more that the operating mode is different between the video codecs (HDX\Blast operates in 4:2:0 mode in this comparison and RDP operates in 4:4:4 mode). Please note that this video codec comparison was made for indication purposes only, it’s not reality that users play full screen videos often (while they can do this from time to time). The comparison is based on a manual testing approach while using screen recording software which will also do it’s own compression on the end result. This will affect the frame quality of the resulting movie. This is not comparable with a professional way of benchmarking with for example frame grabbers. For this type of benchmarks I recommend using REX Analytics (developed by co-members of TeamRGE). REX Analytics also leverages Remote Display Analyzer for remote display protocol insights. The results of the above comparison is displayed below (please note that the Nvidia GPU utilization counter was turned off in this build of RDA, so that’s the reason it shows 0%. The total CPU time consumed is a cumulative of the %CPU usage of the encoder process). Based on the above observations it’s key to compare frame quality to each other and also compare this with a local situation! The above remote protocols aren’t build for remote streaming and remote gaming scenarios (while video and graphical content is increasing). They are build to accommodate a mix of different type of user profiles. That’s why I think it’s very important to have options based on this different type of users, because ones size doesn’t fit all. The display protocol is becoming more intelligent, it can switch codecs and settings by itself based on different content, it would be interesting to see if this will also happen based on the user type or even per application. Because this is not the case for now it’s good to have options! For now I would say HDX has an advantage over the others because it has the most options available to accommodate a lot of different remote display scenarios. As you can see in the above results the difference between HDX and Blast is not that big when you compare the pure H.264 codec implementations to each other. They both performed really well in this test. The video codec implementation in RDP didn’t disappoint me either, well the bandwidth usage does but the experience was really good. It’s very interesting to see how they all keep progressing in the near future, expecting to do more 4:4:4 mode comparisons in the future when this is becoming more mainstream. Remote Display protocols are still awesome technology with a lot of advantages, possibilities and use cases. This blogpost comes without warranty of any kind and observations are based on my own interpretation. Always test and analyze by yourself with a workload that is similar to reality for your environment! 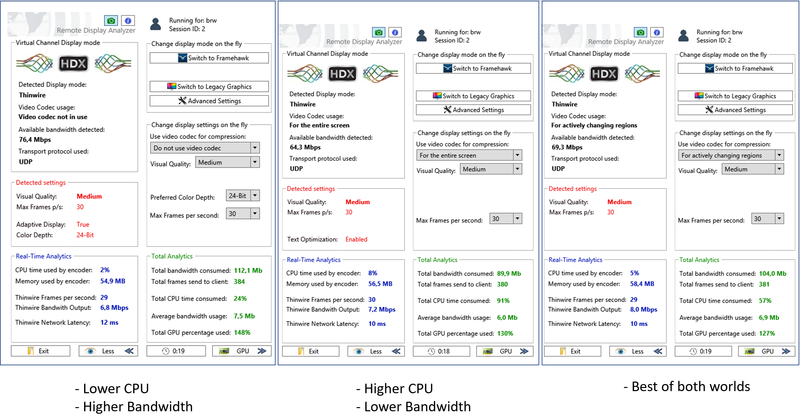 SYN303: Independent Citrix experts deep dive on Remote Graphics, user experience and GPUs. This session was among the top 10 of most popular sessions of Synergy 2017, if you didn’t see the presentation you can watch it on-demand here. In this presentation the new Remote Display Analyzer (RDA) version 1.6 was announced which will be released soon. This version includes numerous new features like a screen capture button and a GPU add-on (available for all display protocols Remote Display Analyzer supports). More about this new RDA version soon. Please note that this results come without warranty of any kind and are my own interpretation based on above test. The results may vary based on factors like workload, bandwidth and the infrastructure you are using. Please always test settings in your own environment to decide which configuration fits best in your scenario. If you read about Remote Display Analyzer for the first time, please click here and here to read more about the project and previous releases of RDA. Remote Display Analyzer is now consolidated into one version, this means you can use the same executable for RDP and HDX. RDA will automatically detect which protocol and settings are in use, you don’t have to configure anything. Remote Display Analyzer 1.5 is now available on the website and sponsors should have received an automatic e-mail which contains more information. Thanks again for your support! If you are reading about App-V Scheduler for the first time: App-V Scheduler is a purpose build deployment tool for App-V 5 and provides features that allow you to perform all actions that are crucial in every application life cycle management process. The power of App-V Scheduler is the amount of fine grained control, instant package delivery and real-time visibility over your App-V 5 deployment. * Since Windows 10 anniversary update and Windows Server 2016 the App-V Client is embedded in the Operating System, this makes your application deployment even easier and more reliable as ever before! And to make it even more a no-brainer to leverage this application deployment method, App-V is now also free to use! For more information about the above new features, please visit the App-V Scheduler website and read the latest release blogpost. Remote Display Analyzer runs as single executable (no installation required) and docks on the buttom right corner of your session. The first release of Remote Display Analyzer was targeted for Citrix HDX, you can read more about this release here. RDA will detect the active display mode (RemoteFX or legacy RDP) and which transport protocol is used for the connection. RDA will also show you the available bandwidth, this is the measured available bandwidth between the client and the RDS session host. The real-time statistics gives you visibility in the real-time bandwidth consumption for both UDP and TCP, also the round trip latency for the active protocol is shown here. This statistics are primarily used for UDP based connections and will show you the Forward Error Correction (FEC) rate (recover from losses without retransmissions) and the package loss and retransmission rate. Frame statistics will show you the number of frames currently being sent to the client, also the frame quality is shown here. You will get a better understanding how RemoteFX is adjusting the frame quality when playing video content for example. Also in case of any skipped frames, you will see how many frames are skipped and the reason why they where skipped. The total statistics section will show you the total analytics during the runtime of RDA. For example here you can find the total number of frames that where send to the client and the total amount of bandwidth consumed for each protocol. Also the average bandwidth consumption is shown here. Just run your workload and see in real-time and in totals how the active display mode behaves in your environment. The total statistics can be reset with the little button just below the total section. Please keep in mind this results are tight to this given scenario, results may vary depending on the workload and available resources. Remote Display Analyzer for RDP is now available on the Remote Display Analyzer website, where you can also find more information about the project. Currently the roadmap for the next version of Remote Display Analyzer is to add support for VMware (so all major platforms are supported) and to add GPU related information. Also Remote Display Analyzer will be consolidated into a single version so you can run it cross platform by just using one executable. If you want to read more about previous released versions, please click here. As you can see there is a new section added called Total Analytics. This will give you insight in the consumed resources after running a specific workload. For example you can run your graphic intense application, your business applications or play a video and measure the total consumed bandwidth and the total frames that are send to the client. The average bandwidth counter will give you an indication what the average bandwidth consumption (per second) was while running your workload. RDA will now also show you the detected (available) bandwidth between the remote environment and your client, there is a reset button which you can use to reset the total analytics back to zero so you can start analysing just before running your workload. The HDX policies are updated to reflect the changes made in XenApp\XenDesktop 7.9 and version 1.4 also contains numerous fixes and improvements. Remote Display Analyzer for HDX 1.4 is now available on the website. All existing sponsors will receive a mail automatically containing their new sponsor unlock password. If you are a sponsor and didn’t receive this mail, please send a mail to info@rdanalyzer.com and we will take care of this as soon as possible. New sponsors will receive a personal unlock password automatically by filling in the sponsor form on the website, thanks for your support and feedback!